Discover this sensational seasonal arrangement. 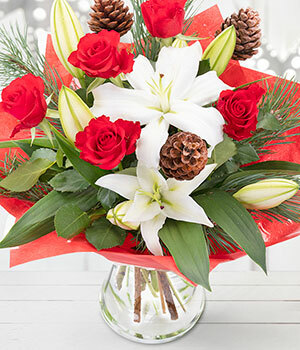 The bold colours of deep red roses combined with oriental lilies to create a red and white Christmas bouquet. Finished off perfectly with pine cone picks to complete the perfect festive florals. The Resolutions is delivered in bud by courier, to let these beautiful flowers bloom in the home, staying fresher for longer.